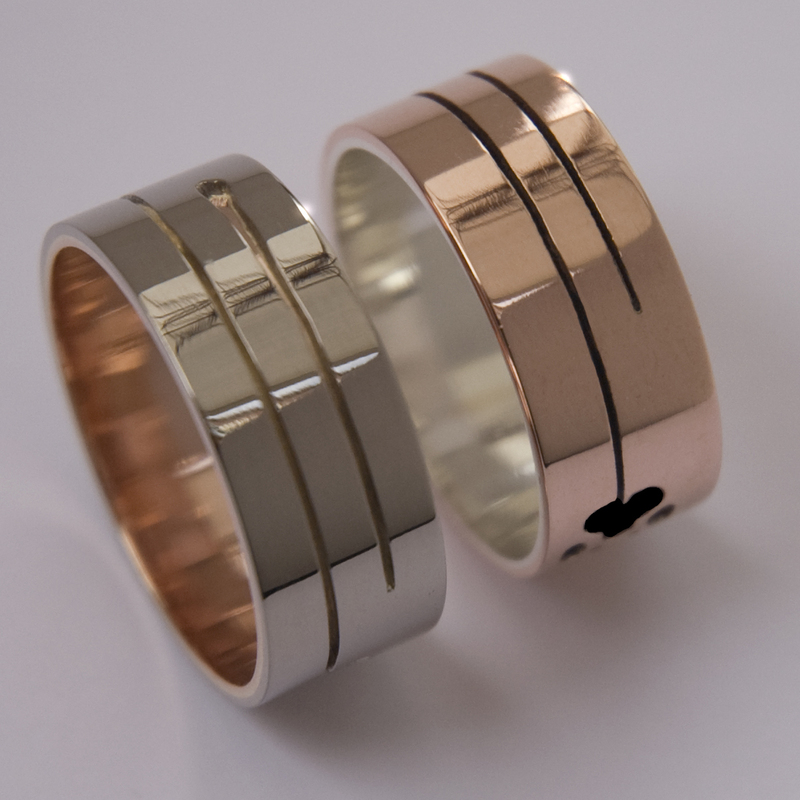 Prices are indicative and depend on ring sizes, the current gold or silver price, and the actual currency rates. *Shipping costs included, US and Canadian tax rates excluded **Shipping costs excluded, Dutch BTW included. 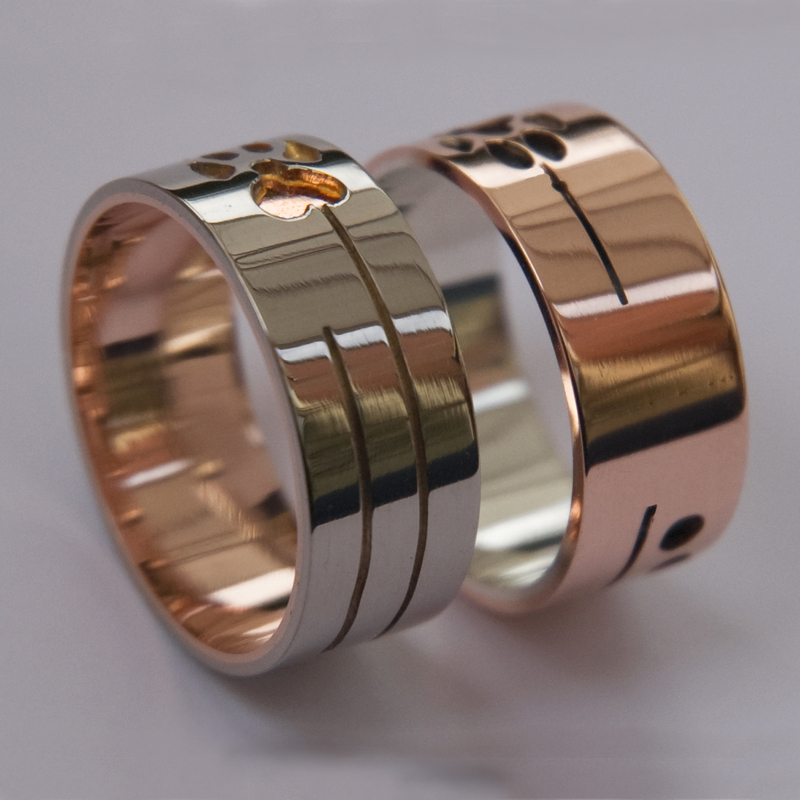 SCROLL DOWN to read about the symbolism of this wedding ring set. Stylized footprints of Ma'iingan the Wolf and Biziw the Lynx feature the designs of these handcrafted, multicolor overlay wedding bands. Each ring has two dots, representing partners for life. 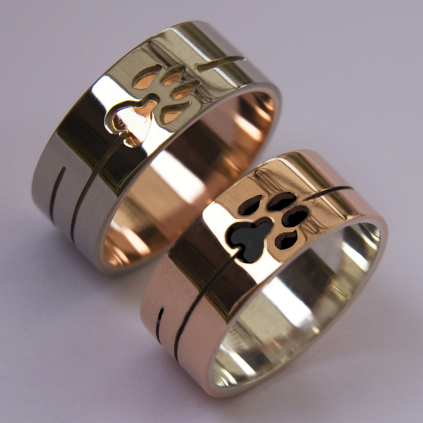 The two straight lines or grooves that run parallel, side by side, around the ring bands represent their individual paths; the longest line, which is the path of the person who's wearing the ring, is connected by the stylized paws of a wolf (the red paw in the ring to the left) and a lynx (the black paw in the ring to the right). Wolf and lynx are known as warriors and wise teachers who show us the way in life. The Elders tell us that there are many paths to follow, many choices to make. We must choose the right one. Make your own footprint on this earth! Gwayako-bimaadiziwin. Wiidosendizog Gidookawi'idizowinimiwaang: Walk the straight road - follow your own footsteps.